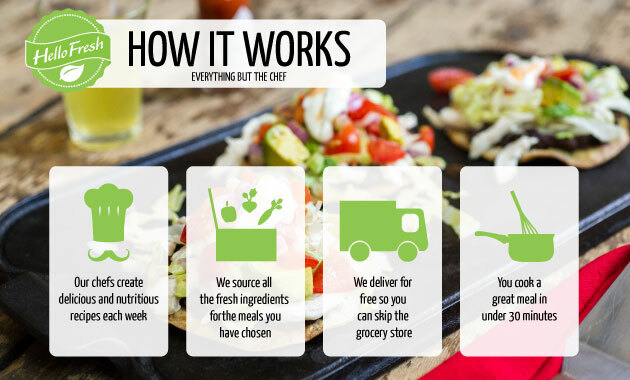 Hello Fresh is a subscription service that delivers 3 meals per week to your door with fresh ingredients for you to prepare for your family. Our box came at the end of the day, everything was well packed and very cold! I loved all the color! Without a doubt, this was my favorite recipe! Hands down! The combination of flavors was tremendous. One thing I have learned through cooking these three recipes is that I need to experiment more with flavor. The flavors are so complex, yet compliment each other so nicely. I will definitely make this one in the summer with our own garden fresh veggies and herbs! This was a kid favorite. We have never actually eaten parsnips before, but they are awesome in flavor and texture. Since we wanted to have enough for everyone to try, I cut the chicken into strips instead of leaving them as whole chicken thighs. The natural sweetness of this recipe was a definite hit! We ate this the day after I was still recovering from a stomach bug. I loved the combination of flavors--lemon, cilantro, chickpeas and beef. My family could have done without the lemon and chickpeas. They did say, they would eat it again sans chickpeas. The directions in this recipe were a bit difficult to follow as written, so I just adjusted to make it easier. I added 2 cups extra broth to stretch this recipe to feed our family of 5. Quality food delivered to your door! All the food we received including the meat was high quality. Variety- We received three different recipes with a unique combination of flavors, textures and foods that we wouldn't have thought to combine on our own. Food is already pre-portioned. You use everything in the package. The only thing I provided was oil, salt and pepper. Very reasonable sized portions--We got the 2 person box and were able to stretch some of the recipes to feed our whole family. Good customer service--We had to cancel our subscription right after receiving our first box, because it does not fit into our weekly grocery budget. It was very quick and easy to do this. Hello Fresh also gives you the option of pausing your deliveries on any given week and up to four weeks in advance. Just note: If you do not pause your delivery, you will be charged. Choices--You can pick between the Classic Box and the Veggie Box each with 3 recipes. If you pick the Classic Box, you have the choice between 5 different recipes. If you don't like one of the standard choices, you can pick a vegetarian option. We didn't want the shrimp recipe offered on the week we received Hello Fresh, so we substituted. If you pick the Veggie box, there are no substitutions. The recipe cards are beautiful, but some of the steps could be hard to follow. I would suggest the recipe writers actually try to make their recipes from the directions given step by step. Some things could be worded better. On one card, there was celery pictured with the other ingredients, even though it is not in the recipe. Overall, I could figure out from the combination of steps and pictures or I just used my best judgment. The price was the only real drawback for our family. Think about how much more convenience foods cost in the grocery store. This is the ultimate, yet healthy convenience food! It's whole, fresh foods portioned out for you to make delivered to your door. You have to pay a price for that. If you were busy and wanted the convenience of healthy food delivered with minimal cooking, you might want to try Hello Fresh. If you eat out 3 times a week at a sit down restaurant, you probably spend the same or more. You could spend that same amount on Hello Fresh and get healthier food. While Hello Fresh does not fit into our personal budget, it might be just what you've been looking for! Click here to see if Hello Fresh delivers to your area! One thing that is covered in the FAQs section is food allergens or special dietary restrictions. Hello Fresh says, "While we don't offer specific dietary plans, because our ingredients are delivered to you in separate packets, if you have any specific dislikes you can simply omit or replace these ingredients from a recipe. You can learn more about the ingredients we use in the Our Suppliers section." Hello Fresh cannot guarantee that cross-contamination with ingredients such as nuts will not occur during packaging. You would need to take that into consideration before ordering, depending upon the severity of your dietary issues.